Yim Na-re, a 34-year-old freelance curator, is one of the supervisors for Seoul City’s program to help residents unearth art on the city’s streets. 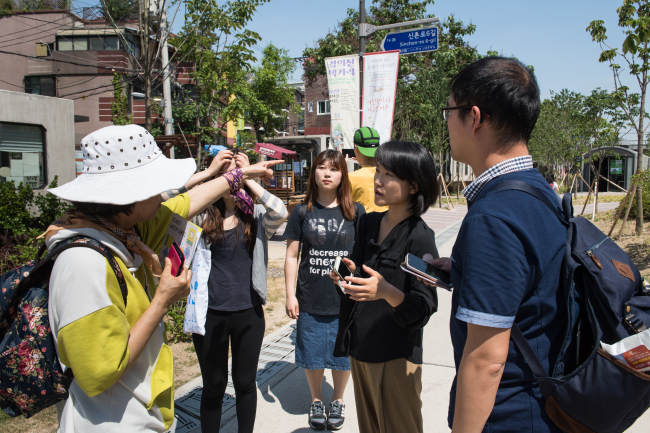 Under the project called “Art on Seoul’s Streets Found by Citizens,” some 100 participants discover and promote lesser-known public art and landmarks in groups of 10, joined by field experts and art connoisseurs. After a 10-year career as a curator and art critic, Seoul-based Yim said many Koreans are still “shy” to open up and discuss about what they feel about art. “Through this project, I try to ask citizens about changes that public art has brought to their lives, whether it is positive and negative. Because by talking about it, they can take the meaning of art to the next level, like ‘Shoes Tree’ in front of Seoul Station,” Shim told The Korea Herald. “Shoes Tree,” an art installation made of 30,000 worn-out shoes near Seoul Station, elicited mixed reviews after its unveiling last month. Some called it a giant pile of garbage. But others, refraining from premature judgment, expressed curiosity about its artistic intention and meaning. Although the city government is providing a variety of cultural programs to appreciate public art like through municipal art lectures, providing a platform for citizens to appraise and discuss about Seoul’s public art is important in improving public art, according to Yim. Shim So-mi, an independent curator with a 14-year experience in the industry, echoed the view. “When it comes to public art, citizens should participate from the early stage of planning to removal. Citizens, instead of institutions or building owners, are the main appreciators of public art with responsibility to provide their opinion,” Shim said. As such an example, the curator referred to Taiwan’s Treasure Hill, an illegal settlement-turned-artist village where residents there reinvented the area into a sustainable urban community in Taipei.